1 drawing on paper, lined and laminated : ink ; 6 x 9.5 in. 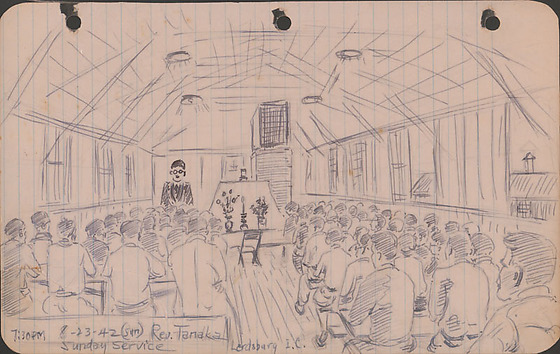 Ink drawing of evening Sunday religious service led by Reverend Tanaka at Lordsburg Justice Department Camp, New Mexico on August 23, 1942. View from back of a full barracks used as a chapel. Men seated at tables with backs to viewer with center aisle separating two sections ; a single empty chair in aisle in front of altar composed of candle with vases of flowers at back center. Reverend Tanaka stands next to altar facing viewer in black with glasses and mustache. Lights are on and view of other barracks visible through open windows on right. Written in black ink, bottom left corner: 7:30PM 8-23-42 (Sun), Rev. Tanaka / Sunday Service, Lordsburg I.C.